Congratulations on your purchase of your Evoz! Getting started with your wifi baby monitor should be easy, but if you do encounter bumps in the road, hang tight – we’ll have you up and running soon! For a super-quick overview of monitor setup, watch this video. There are more details under “Getting started – the basics,” below, and solutions to common setup issues at the end of this post. Install the free Evoz Baby app on your smartphone or tablet. The app is available from from the App Store (for iOS devices, version 9+) and the Play Store (for Android devices, version 4.1+). Create an Evoz account. Open the Evoz app and tap Create New Account. Enter your email address, a password, and a screen name. We’ll send a confirmation email to the address you provided. Open the email and tap on the Confirm Email button to finish setting up your account. Plug in your Evoz monitor. The indicator light on the monitor will be solid for around 30 seconds, then start blinking. Open the Evoz app again. You might need to log in with the account you just created. Enter your family name and baby’s information when prompted. On the Add Monitor screen, enter the password for the WiFi network you are currently connected to. The next screen will display a QR code. Hold your device in front of the monitor so that the camera can “see” this code. In a few seconds, the monitor will ding, indicating that it has received the WiFi information. You can now move your device away from the monitor. Wait patiently while the monitor connects to the app – this can take up to a minute. The indicator light will blink blue while the monitor is trying to connect, and change to solid blue when it has successfully connected to the network. A note about firmware updates: sometimes to fix bugs or improve security, we need to update the software running on the monitor itself (firmware). The first time your monitor connects to the internet, it will check for firmware updates. If one is needed, the monitor will start downloading the update automatically, and once the download is complete the monitor will restart itself. The whole process could take up to 20 minutes – please be patient and rest assured that we’re working to keep your monitor up-to-date and secure. When the monitor connects successfully, you can give it a name. Tap the speaker icon to start audio-only streaming from the monitor, or the camera icon to start video streaming. Press the pause button to stop streaming. If you navigate away from the monitor screen while you are streaming, the app will automatically switch to audio-only mode. Have fun! Once you’ve explored on your own a little, you might want to come back and check out our posts on setting up alerts, sharing access to your monitor, and connecting to another WiFi network. I can’t log in to the Evoz Baby app. Make sure you’ve confirmed your email address by clicking on the Confirm Email button in the email you received from Evoz after you set up your account. I’m holding the QR code in front of the monitor, but I never heard the monitor ding. Try adjusting your screen brightness to the middle of the range. Then hold the screen fairly close to the camera, and slowly and smoothly move it backwards. 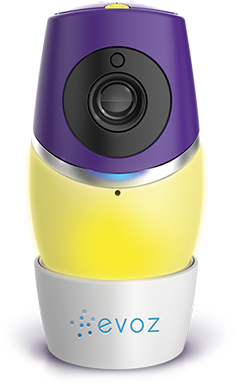 Please note that this will only work with Evoz monitors – the Evoz Baby app is not compatible with other brands of baby monitor. The monitor dings, but never connects to the WiFi network. Your network password has an apostrophe (‘) or quotation mark (“) character in it. Evoz unfortunately doesn’t currently support those characters – you’ll have to change your network password and try again. Your network is hidden. Unhide it, connect the monitor, and then rehide it. The indicator light does turn to solid blue, but the monitor doesn’t connect to the Evoz app. You may need to reset the monitor. Insert a paper clip or other thin object into the reset hole. The reset hole is behind the lens arm on the Evoz Vision, and near the power jack on the Evoz Glow. The indicator light should change to a solid color (green on Glow, purple on Vision) and then start blinking again. Once it is blinking, try showing the monitor the QR code again. My monitor needed a firmware update, but the process got stuck somewhere. It is possible for the app and the monitor to get out of sync during the firmware update process. If the monitor does not reconnect to the internet (eventually show a solid blue indicator light) when it restarts after the firmware update, try physically unplugging it, waiting a few seconds, and plugging it back in. If the monitor still does not reconnect after a few minutes, reset the monitor by inserting a paper clip into the reset hole, as described above (don’t worry, this will not delete the firmware update!). Once the indicator light is flashing green, open the app, tap Monitors, then tap the name of your monitor, then Reconnect Wi-Fi. Enter your WiFi password and display the QR code to the monitor. Once the indicator light is solid blue, you can tap Back go back to the main screen, or just restart the app. No worries – send us an email at support@myevoz.com and we’ll do our very best to help. If your problem has to do with an app crash, you can help us diagnose the problem by sending an email using the Email Support option from the app menu. This email automatically includes a copy of your app’s log file. 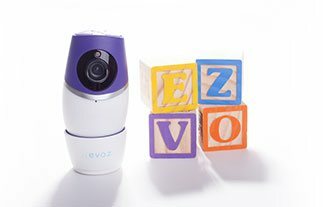 Once you’ve finished getting started, you’re ready to explore the features of your new Evoz Wifi Baby Monitor. Once you’ve explored on your own a little, you might want to come back and check out our posts on setting up alerts, sharing access to your monitor, and connecting to another WiFi network.